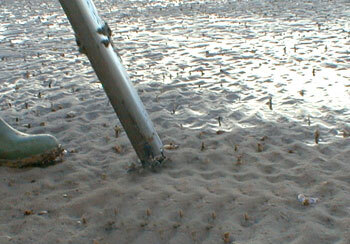 WARNING: black lug worm beds are usually at the low tide mark, and can only be reached by walking great distances, in some cases over 2 miles from the foreshore. You are advised to pay particular attention to the weather conditions, as well as having some knowledge of the tidal flow in the area you are collecting. It is also recommended that you carry a compass and take a bearing from the shore before setting out, then in the event of fog or mist coming down you are able to get back to shore safely. DO NOT carry on collecting bait if weather conditions close in, return to the shore asap. It is also advisable to carry a mobile phone so you can alert the coastguard should you get in to difficulties. 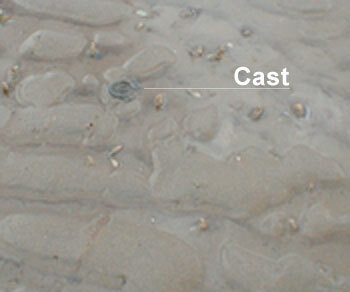 Black Lug is identified by a cast, that may not be black, but will have no visible blow hole like the Blow Lug has. You may see what appears to be a blow hole in the centre of the cast. Place your bait pump 3 – 4 inches away from the cast and at a slight angle (20 degrees or so) to the cast, push the pump into the sand about 4 inches and pull the handle upwards, be careful not to fully extend the handle as this will cause loss of suction, clear the pump of the sand that you have just sucked up and repeat.